Discussion in 'Military Biographies' started by liverpool annie, Jan 13, 2009. Was a British Indian Army officer who led the ultimately disastrous first British Expedition against Baghdad during World War I and was later elected to Parliament. Townshend was born into a family with strong ties to the British army. He was a descendant of Field Marshal George Townshend, 1st Marquess Townshend (his great great grandfather), whom he wrote a book about. Educated at Sandhurst, Charles served in the Sudan Expedition of 1884, the Hunza Naga expedition in 1891, and was the garrison commander during siege of Chitral Fort in the North West territories in 1895, for which he was awarded the CB. He transferred to the British Egyptian army and again fought in the Sudan at the Battle of Omdurman in 1898 (he was awarded the DSO for his efforts). Townshend achieved the rank of Brigadier General in 1909, and Major General in 1911. With the outbreak of World War I, he was put in command of the 6th Indian Division. This large military force was one of the best of the military units of the Indian Army - though it was under-equipped by the standards of the regular British army. The 6th Indian was sent to Mesopotamia in early 1915. Townshend was encircled on 7 December. Relief attempts failed in January and March 1916, and, his supplies exhausted, Townshend surrendered with 10, 000 men in late April. His defeat dealt a serious blow to British prestige. Many of Townshend's soldiers perished in their harsh captivity. He himself lived in comfortable confinement in a Black Sea resort, and received a knighthood during his captivity. Although he was well received in 1918, he was rightly given no further military employment. St Mary Church is a church that was rebuilt in the 1860 ...... the most interesting memorial is to Townsend of Kut ....... Kut-al-Amara might be considered the first Iraq war. 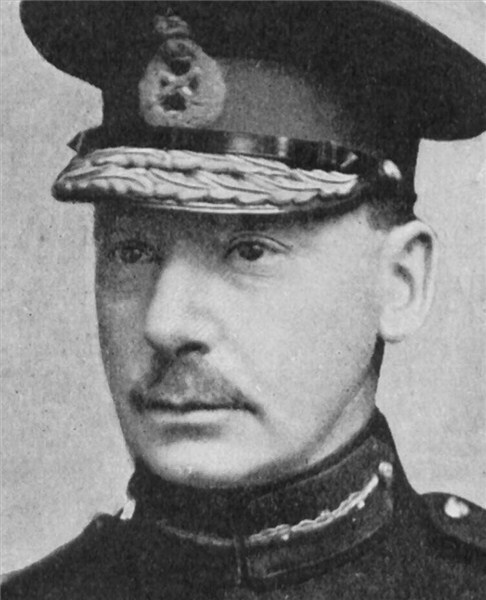 Major General Townshend was in command of the 6th Indian Divison which was sent to Mesopotamia in early 1915. He was ordered to advance up the Tigris with the aim of capturing Baghdad. On the 3rd June Amara was captured and on the 28th September Kut followed. Townshend suggested halting but his superior General Nixon was convinced the Turks were weak and could be beaten so gave the order to continue to Baghdad. The critical battle was at Ctesiphon which ended in a draw. Townshend had lost one-third of his men so they retreated to Kut. Baron von der Goltz the leader of the Ottoman troops, learning of the British retreat, turned his weary battle scarred troops round and followed the British down to Kut. The siege ended on the 22nd April 1916 but the baron had died on the 16th April from typhoid. It was a busy month because Townshend surrendered on the 29th April. He was treated royally by his Ottoman captors but many of his men died in forced labour camps and his officers were treated deplorably. Nevertheless Townshend was awarded the KCB for his command at Kut while he was still a POW. He was involved in the subsequent armistice talks. In 1920 he resigned from the army and was briefly an MP. Over time reports surfaced of how badly his troops had suffered (half having died in captivity) and his reputation disintegrated. He died in disgrace although the memorial erected by his wife saying simply to the one whose memory will always live shows that someone saw things differently. I thought this maybe of interest also .... ! The heroic 6th Division took Amara in June, Kut-el-Amara in September, and in November fought and won that tremendous two days' battle at Ctesiphon. Then, faced with odds of five to one against him, apart from the lack of water, Major- General Townshend withdrew his little army for ninety miles back to the river bend at Kut, fighting, meanwhile, a rearguard battle at Azizie, which smashed and utterly misled the van of his pursuers. Arriving at Kut on December 5th, he characteristically sent off his one brigade of cavalry and his horse artillery to the assistance of the force under General Aylmer that was marching over highly difficult country to his aid. Three months passed, and found the enemy still kept at bay, and Townshend still sending out cheery messages to the outside world. From other sources came evidence of the superb confidence with which he had imbued the force under his command. He himself believed in his star. He had borne a charmed life. Despite their sufferings from the elements and from disease, as well as from the Turks, his men believed he could never be beaten. They "banked" on him, even during the arduous forced retreat across the arid surface of that dead world between Ctesiphon and Kut, which was once so fertile and so flourishing. He had proved beyond cavil, in offence and defence, that his favourite study of Napoleon had not been in vain. But beyond his professional abilities, his personality stood out in strong relief. A disciplinarian, he never believed that discipline was inseparable from sour faces; and in intervals of leisure would personally take part, vocally and instrumentally, in the lighter, amenities of life in camp. One of his requests during the siege of Kut was for gramophone needles, and these reached him by aeroplane.